The fiscal year 2018 Annual Report for the State Foundation on Culture and the Arts has been published. The PDF can be downloaded here: 2018 SFCA Annual Report. In fiscal year 2018, the State Foundation on Culture and the Arts (SFCA) experienced tremendous growth as our efforts were concentrated on arts engagement, building agency capacity through collaboration, and strategic planning. Engaging audiences shifted from providing arts experiences, to including how one participates or engages in creativity. With this in mind, we looked at providing opportunities for cross-training between programs where staff collaborated and gained new skill sets, ultimately creating a stronger, more efficient agency to support our mission. The SFCA completed its 2014-2018 Strategic Plan while a new plan for 2019-2023 was developed and finalized. 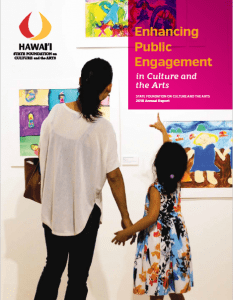 Through our programs in schools and out of schools we are encouraging people to embrace creative expression as an integral part of life in Hawaiʻi. Engagement in the artistic process fosters creativity, critical thinking, collaboration and communication, often referred to as “21st Century skills.” Society needs creative and critical thinkers who can help to solve problems. It is a responsibility of society to promote these skills in students by supporting arts learning in and out of schools. People who create are expressing themselves and gaining an understanding of who they are. More frequent updates about work that the agency is doing can be read in the SFCA’s monthly email newsletter (subscribe at Newsletter Sign-Up or read online in the newsletter archive).